Since I am just new to Thailand after just having stayed at the Thai border for only 5 months now, I get very excited in getting myself familiar with the place. I haven't got the chance to explore Bangkok, though. Had been there for just one day last March and although I have already visited the nearby town of Chantaburi which is just one hour ride from my work place a couple of times, I guess, I still have lots of things to explore. 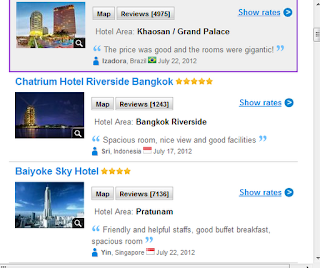 I am currently in a look out for some good accommodations at Bangkok in preparation for our October vacation. I already promised my kids that I will bring them to Bangkok during the school break and I should fulfill that promise. As what I normally do during our trips, I think I will still stick to booking our accommodations through Agoda. From there, I could get some great discounts and I would also be getting "points" which I could use for my future bookings. I love the idea that I am able to see some photos of the hotels and could read some reviews from the other travelers where I could get more information about the place. I was a member of Agoda for more than 2 years now and I'm enjoying the perks of being an Agoda member. I also love the idea that I could pay for my booking online using my paypal account which is safer and more convenient for me. I haven't figured out though at this stage where we would finally stay. 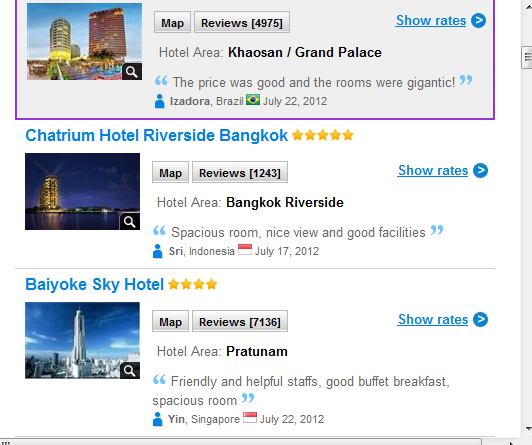 I want to choose the hotel which is conveniently located so we could make the most of our trip. I have a number of options now and I'm still trying to figure out which one will be best for our requirements. I'm getting excited day by day! I have done bookings through Agoda too because most of the time they offer lower rate compared to going directly to the hotel for booking. You'll be getting the same package anyways, haha! My friend loves Thailand. She just spent a few months there. Very cheap daw ang mga items at ang sarap mag shopping. She bought me curry powder and sobrang sarap. Thailand is also part of our list. My wife and I have planned this long time ago. :) (long time like, 2 years ago). I want to go to Pattaya also as what my friend suggested who have gone to place.